L.A. Is My Beat: How Many is Too Many? I've been on a bit of a ukulele acquistion binge lately. How many ukuleles is too many? At this moment, I own six ukes. All of them are different with different sounds and personalties. My first uke was a Fluke. I traded in this ukulele for my concert Ohana with the long neck. I truly love this ukulele that I purchased at McCabe's Guitar Shop in Santa Monica. It's plain, portable but with a big, warm sound. My brother built me a custom ukulele when I started playing seriously, about 12 years ago. I also like this little uke. It's a cross between a soprano and a concert size with a custom tiki head, made out of koa wood. Ken inlaid my nick-name, L.A. Ell, into the fret board! 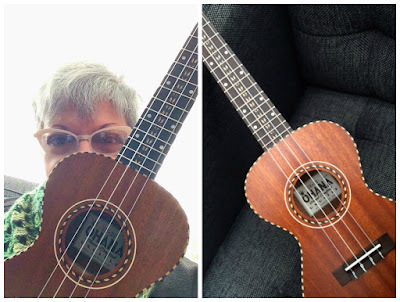 I've been playing those two ukuleles for years, until finally I saw the Kala Salt and Pepper, Doghair tenor ukulele in "Ukulele" Magazine. Oooooooo! I'd been wanting a tenor uke for a bigger sound. I could not pass up that black and white, shiny finish! This was a special order from the Kala Factory in Northern California. I play the Kala most often in class and for performances. Last year we were going to Hawaii for a few weeks. I definitely wanted to take a ukulele with me. I thought it might be easier to take a soprano with me on the airplane, so I zoomed down to U-Space in Little Tokyo and consulted with expert, Jason Arimoto. 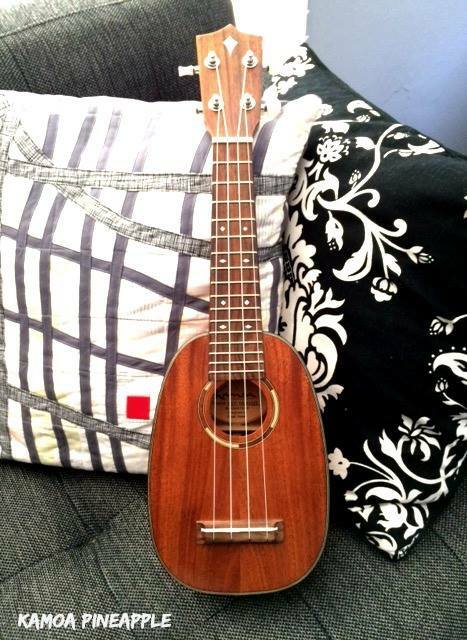 I ended up with a sweet little pineapple Kamoa soprano ukulele. For such a small uke, it has a surprisingly big sound. I love the little oval shape. Since purchasing the little pineapple, above, I've been on a bit of a buying binge. Just before Christmas I tried out the Magic Fluke "Firefly" Banjolele, concert size at Boulevard Music in Culver City. I loved the twanginess of it. It's super light-weight and easy to play. It was on sale! I hinted to Larry that I sure would like to have that banjolele for Chanukah. I've played 5-string banjo since I was a teenager, but I'm kinda' rusty on those banjo techniques and chords. The banjolele is a ukulele, so you can use the same strums and chord configurations as a regular ukulele! 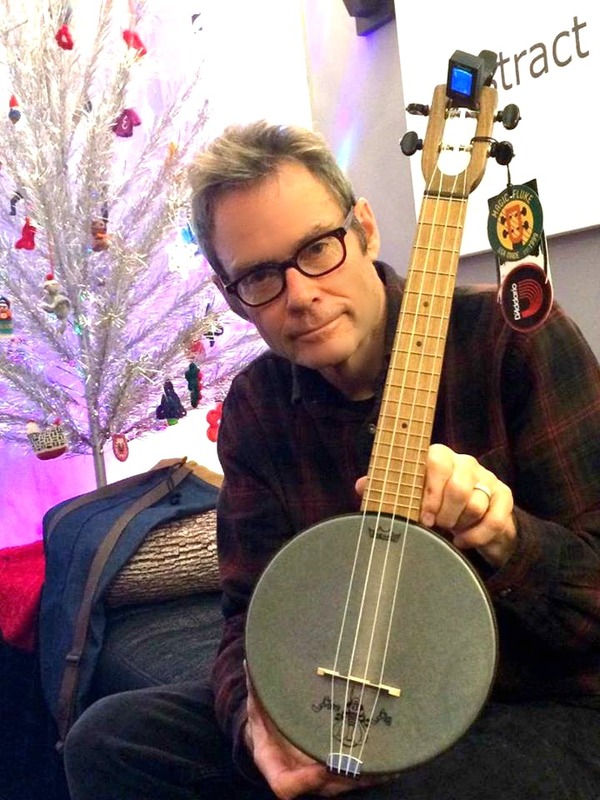 Larry is a doll, so he bought me the banjolele. It is rather loud, so half the time I play it with a damper cloth stuffed into the back. 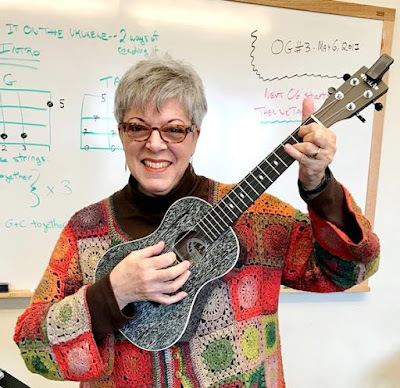 A few weeks ago I was browsing through the Mim's Ukulele website. I'd read about Mim in UKULELE Magazine. She claims to be an expert at setting up your ukulele. I noticed a very vintage-looking ukulele reproduced after the Portuguese ukuleles made by Manuel Nunes in the late 1800s. 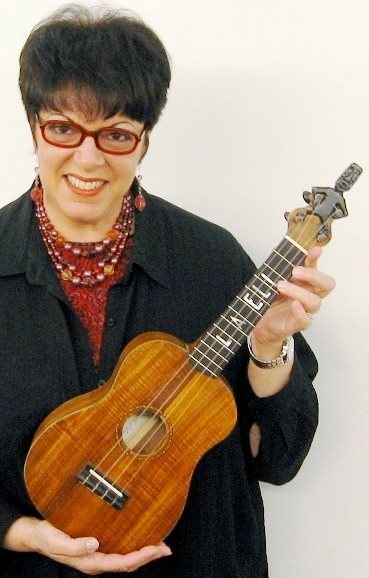 These were the first ukes introduced to Hawaii. The slim waist body shape has been reproduced, along with the rope binding. Ohana extended the rope binding feature to the back of the uke as well as across the center of the headstock, down to the middle of the finger board. I first saw this ukulele model at the Torrance Ukulele Festival this past summer. 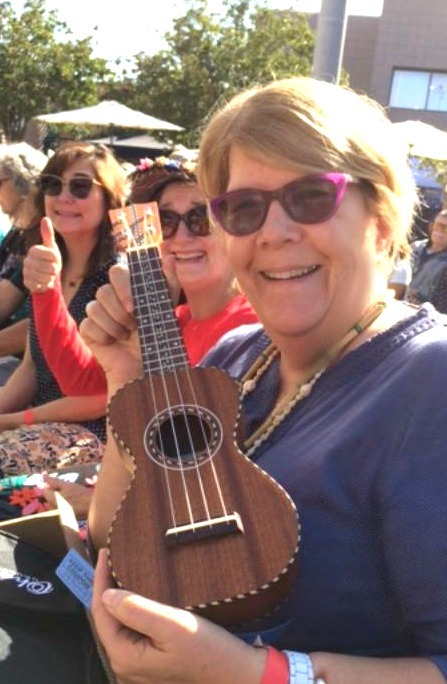 One of Natalie's friends, Mary actually won the drawing for this sopranino model....so cute! When I saw a larger version on Mim's website, I decided to order it. I LOVE this ukulele! It came to my doorstep within 4 days of ordering. Mim really is an expert at uke set-up. I swear, it was almost in tune after traveling all the way from Floyd, Virginia to Los Angeles! Thanks for the speedy and excellent service, Mim! So, really, how many ukuleles are too many ukuleles? I don't think that six are too many to own. I'm keeping them all...for now!